A new study from Stanford University suggests that the kind of hot, dry conditions that can shrink crop yields, destabilize food prices and lay the groundwork for devastating wildfires are increasingly striking multiple regions simultaneously as a result of a warming climate. According to the researchers, climate change has doubled the odds that a region will suffer a year that is both warm and dry compared to the average for that place during the middle of the 20th century. 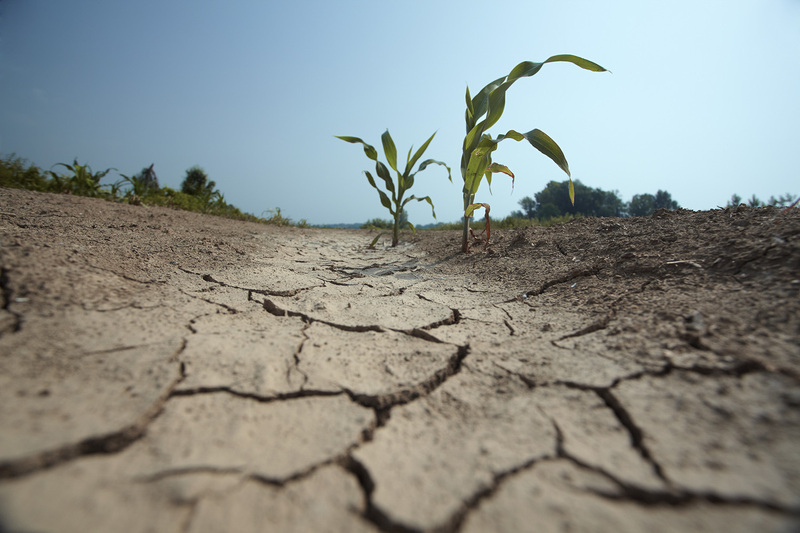 It’s also becoming more likely that dry and severely warm conditions will hit key agricultural regions in the same year, potentially making it harder for surpluses in one location to make up for low yields in another. “The global marketplace provides a hedge against localized extremes, but we’re already seeing an erosion of that climate buffer as extremes have increased in response to global warming,” said Diffenbaugh, who is also the Kimmelman Family senior fellow in the Stanford Woods Institute for the Environment . The new study points to a future in which multiple regions are at risk of experiencing low crop yields simultaneously. That’s because, while some crops can thrive in a warm growing season, others – particularly grains – grow and mature too quickly when temperatures rise, consecutive dry days pile up and warmth persists overnight. As a result, hot-dry conditions tend to produce smaller harvests of major commodities, including wheat, rice, corn and soybeans. The implications extend beyond agriculture. Those same hot, dry conditions can also exacerbate fire risk, drying out vegetation in the summer and autumn and fueling intense, fast-spreading wildfires like those that burned through more than 240,000 acres in California in November 2018. Yet despite that simple intuition, accounting for ongoing, interdependent changes in both precipitation and temperature in different locations through time presents a statistical challenge. As a result, many past analyses have looked at warm and dry events as independent phenomena, or at different regions as independent from one another. That approach may underestimate the added risk due to human-caused global warming, as well as the social, ecological and economic benefits of curbing emissions. “When these extremes occur simultaneously, it exacerbates the adverse impacts beyond what any of them would have caused separately,” said Ali Sarhadi, the study’s lead author and a postdoctoral scholar in Diffenbaugh’s Climate and Earth System Dynamics Group at Stanford Earth. 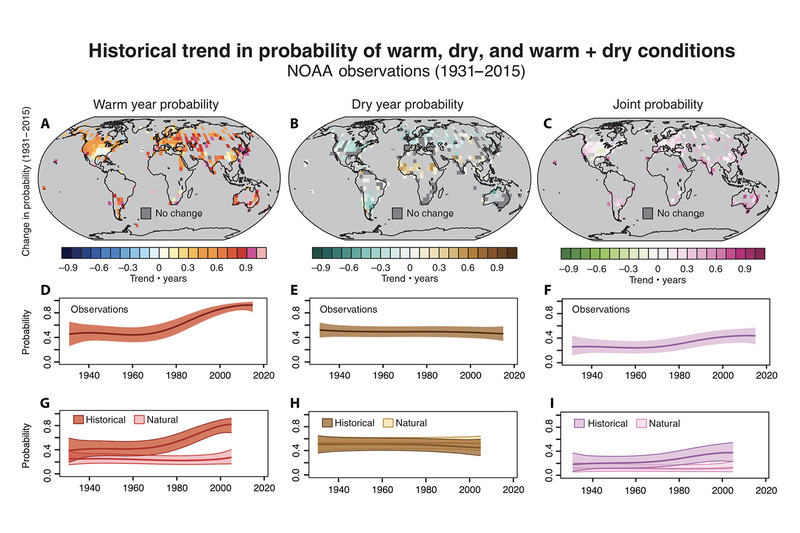 The new study used historical data from the past century to quantify the odds that different regions experience hot and dry conditions in the same year. The analysis shows that before 1980, there was less than a 5 percent chance that two region pairs would experience extreme temperatures in a year that was also dry in both regions. However, in the past two decades, the odds have increased to as much as 20 percent for some region pairs. 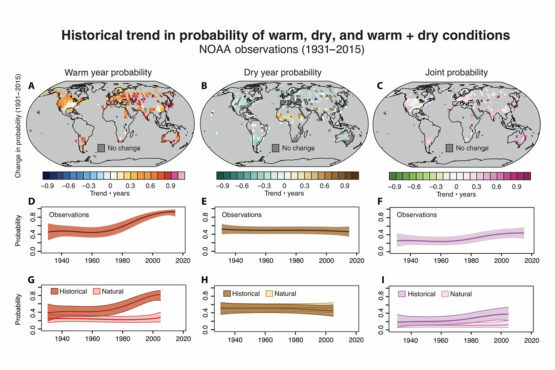 In addition to their analyses of historical data, the authors also analyzed climate model projections of possible future global warming scenarios. They found that within a few decades, if the world continues on its current emissions trajectory, the odds that average temperatures will rise well beyond the range normally experienced in the middle of the 20th century could climb upward of 75 percent in many regions. But achieving the goals outlined in the United Nations’ Paris climate agreement is likely to substantially reduce those risks, Sarhadi said. While the White House has announced its intention to withdraw the United States from the agreement, the study shows that achieving the emissions reduction targets in the 200-nation pact would allow the world to dramatically reduce the likelihood of compounding hot, dry conditions hitting multiple croplands across the world. “There are still options for mitigating these changes,” he said. The framework built for this study represents a vital step in pinning down the risk associated with multiple climate extremes coming together in one region, where they can often compound one another. What were the chances, for example, that high temperatures, high winds and low humidity combined to create mega fire conditions in the past, and how have those odds changed as a result of global warming? That’s the sort of question the team’s framework will be able to answer. It’s a gravely urgent one for officials now reckoning with fires of historic scale and intensity in California. “A lot of the events that stress infrastructure, and our disaster prevention and response systems, occur when multiple ingredients come together in the same place at the same time,” Diffenbaugh said. High storm surges and wind speeds with heavy rain can make the difference between a passing storm and a calamitous tropical cyclone; wind patterns and moisture levels in different parts of the atmosphere influence the severity of a rainstorm and associated flood risk. A key challenge for decision-makers is understanding what to expect in a changing climate. That means honing in on joint probabilities, which are at the core of calculations that engineers, policy-makers, humanitarian aid providers and insurers use to allocate resources, set building codes and design evacuation plans and other disaster responses. Diffenbaugh is also an affiliate of the Precourt Institute for Energy . Study co-author Danielle Touma is a doctoral candidate in Earth System Science at Stanford Earth. Additional co-authors are affiliated with Universidad Carlos III de Madrid in Spain. The work was funded by the Department of Energy and Stanford University.